Hi guys. How is your three day weekend going? This is the last official day of summer here at Our home, tomorrow Nora starts first grade. And the following week, my boy’s start preschool. We are using it to get some things done around the house, and spend time with the kids. Anyways, onto this here blog. 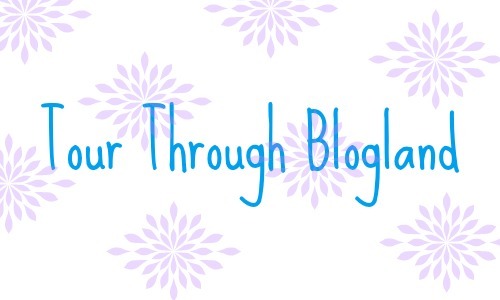 Today I am honored and excited to be a part of a Tour through blogland. It is a way for bloggers to celebrate others, share some tiny pieces of themselves, and introduce even more talent to other’s. 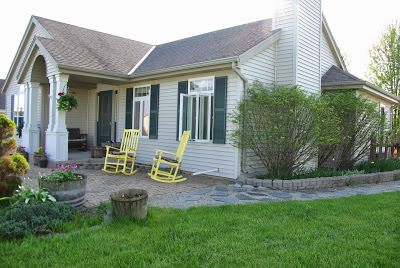 I was nominated by Vicki and Amy at Canary street crafts, they are a Mother and daughter duo who blog about home decor, recipes, life, fun, all of it. There is some amazing things they have created. 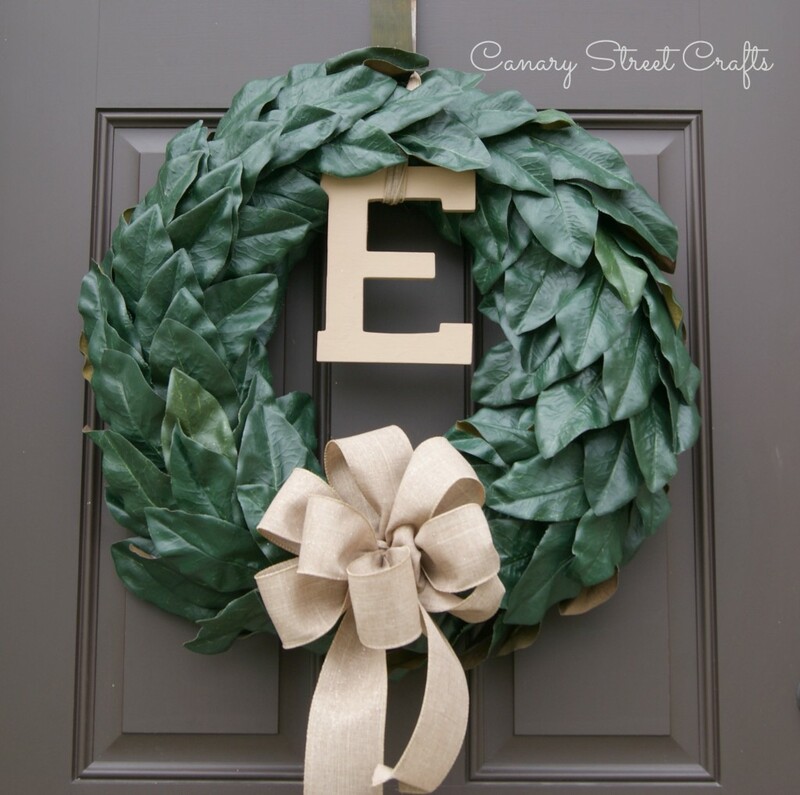 This wreath is one of many beautiful things they have created. I was so honored to be thought about to take part in this, and cannot wait to pass on the torch next week. But more about that in a minute. For now I am going to show off a little bit of my home, what I am up to. I re did the chandelier, here. 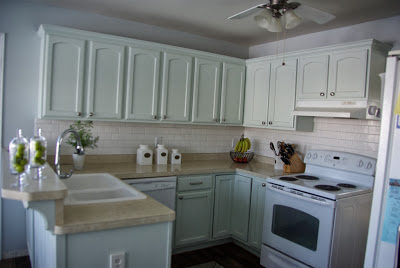 We also painted the kitchen, added back splash, painted the walls, and put in new hardware. All of those tutorial part 1 and part 2 are available to see. 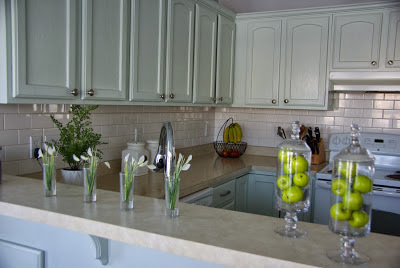 The cabinet color is a sage/mint green. Really subtle, but enough to make the space feel updated. We also added the dark wood floors throughout the living area in here as well. 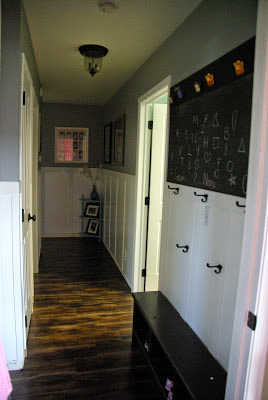 Here is the hallway, we painted the walls, updated the ceiling lights, and added the board and batten. It is not done yet, but a tutorial is hopefully not too far behind. Once it is done, on that never ending to do list. 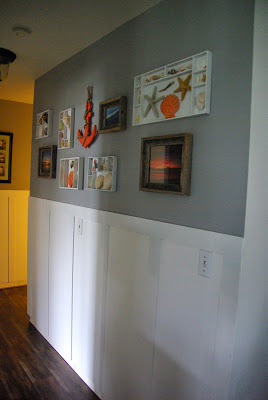 This coastal gallery wall/display wall was created with my hometown of San Diego California in mind. The full post and tutorial is here. Here is the living room and entryway. We created this industrial console table. One of my favorite projects I have done so far in my home. I love it! 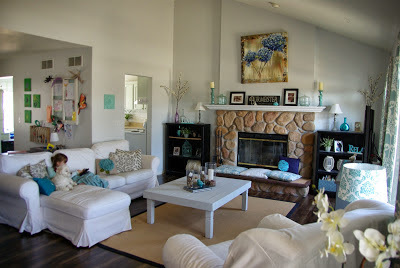 Here is our living room, lots of small projects here that I have done, but the biggest one is the coffee table redo. 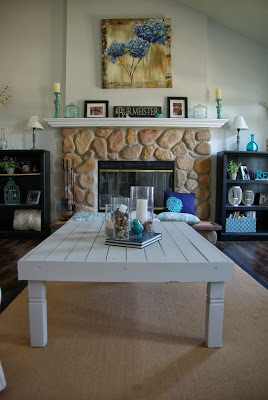 I have big plans to add built ins on the sides of the fireplace, someday. Soon I hope! And yes, that is a child and dog on the couch. 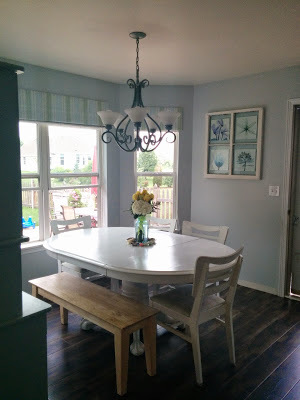 It is very rare to get a completely kid and animal free moment in this home, blog pictures included. 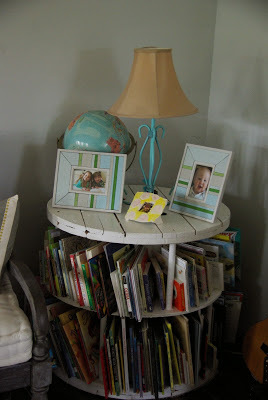 This spool was redone and turned into a bookshelf. 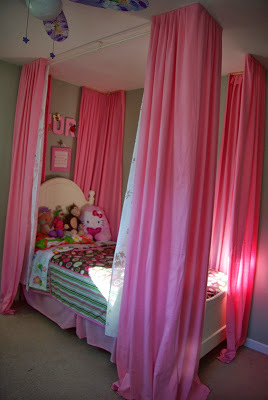 I made my daughter Nora’s dreams come true by creating a canopy like bed with these curtains. 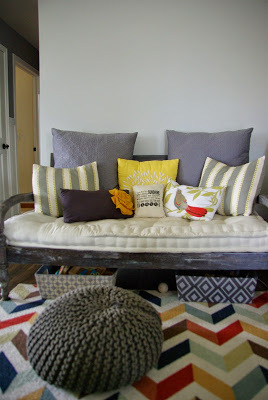 Now that I gave you a mini tour of my home I will give you tour through blogland…. We have just finished up a big time bathroom redo. I think I am going to break it apart into a few projects before I do the big reveal. I am also looking to paint and decorate my bedroom and add the built ins to the fireplace. 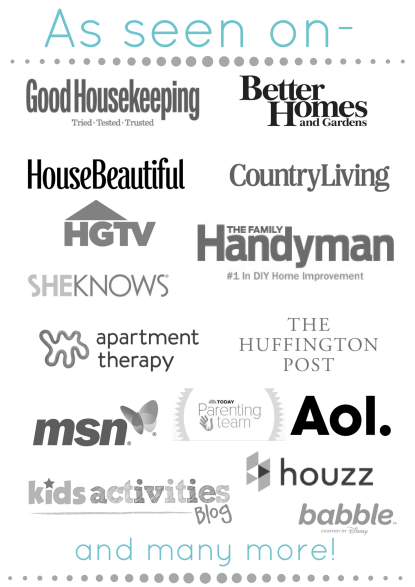 I also am going to start being a contributor at Fancy Shanty and Homedit. 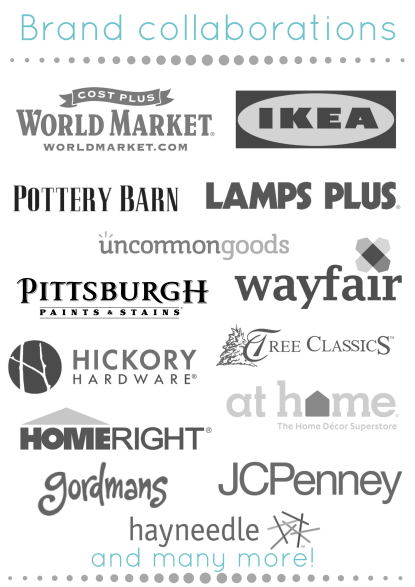 I am really excited about these new ventures. I will be starting these in the near, near future. And sharing with you all anytime I have a article up over there. I will be sharing new and some old projects of mine. I am so excited to be in the company of other amazing contributors and talented people. I think my work differs from other’s because it is mine. I am not saying mine is any better or worse (hopefully) then others. But there is only me creating for my space, in my home, with my family’s needs in mind. 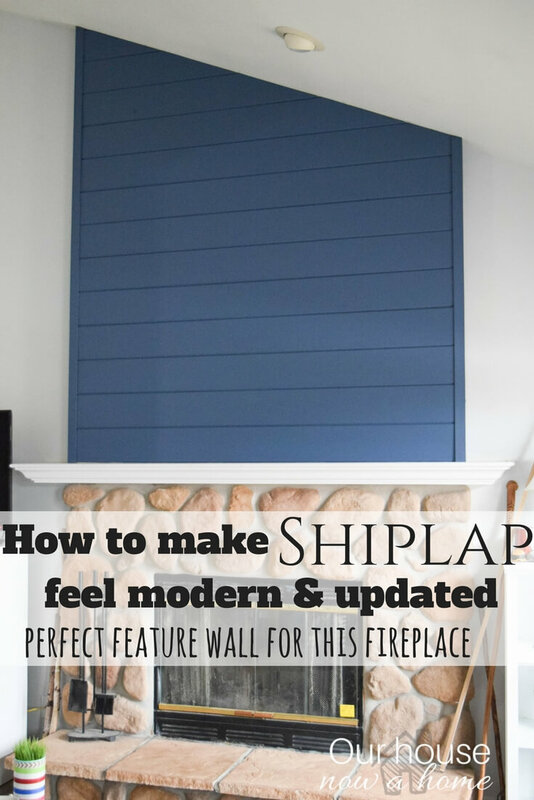 I created this blog because I had found a way to create and make my home the exact way I wanted without breaking the bank. I wanted to share it with others. 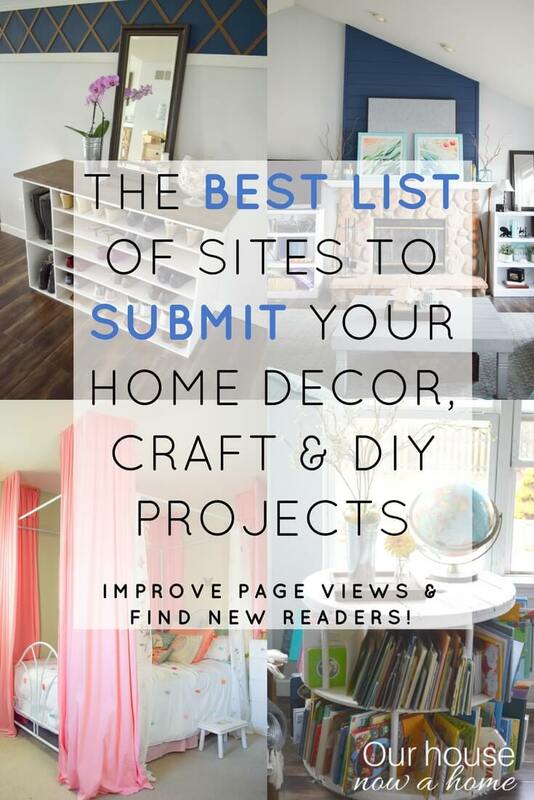 I was not aware just how many other home decor blogs existed with this similar mentality in mind. But I am still me, writing, and creating for me. I hope that what people take from my blog is they can create too, using my ideas. Or use it as a jumping off point to do exactly what is right for them and their home. Our house now a home, is anyone’s house being turned into a home. I began creating the way I did as a means to an end. I wanted the dream home, on a young family budget. As the saying goes champagne taste on a beer budget. I create champagne out of beer so to speak. I now look at it as a challenge, can I get a light I want for $20? Maybe, I am going to try. 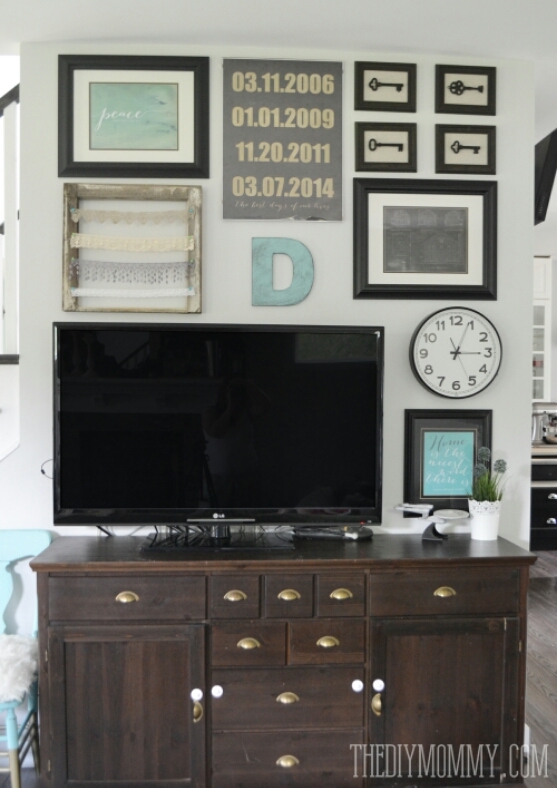 I love having someone compliment something in my home and I proudly yell out the price I spent on it. Gets me every time. I write because it is something I have always enjoyed doing. For a few years I put writing on the back burner, work, kids, responsibility’s got in the way. And then once I started this blog the love of writing came flowing out of me again. Now, I can’t get enough of writing or anything home decor. It is my “thing” and I love it. 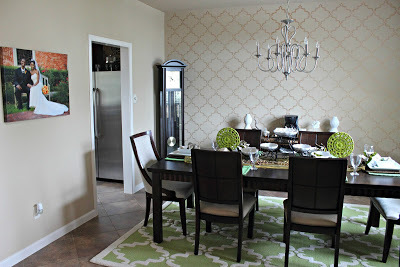 I have been able to find a balance of family, life, decorating, creating and writing. I am now fortunate enough to see a career blossoming out of this, very excited to see where my previously hidden but now bursting out passion will take me. Both of these differs from week to week. Sometimes I have a whole month planned out, with projects set up and done accordingly. On those times I am able to write the whole following week of posts right away. Those times are nice and organized. Other times life happens. Projects took longer then expected, my mind is drawing a blank on inspiration, the kids are sick, needy, or just being three young kids. Whatever is happening. I have set a goal of one project a week to share on this blog. To keep things fun, interesting and not stagnate for you guys. Most of the time I have more then one waiting and ready to go. As far as writing the posts, sometimes I write in the evenings when my kids are in bed, during nap (rarely do they nap anymore), or if the kids are occupied I hop over to the computer and try to get a post done. 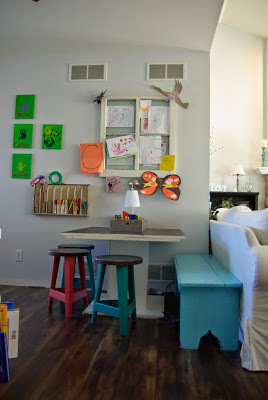 My life with three littles is organized chaos and this blog seems to follow that trend. It all gets done, I seem to always come back for more, and am always eagerly wanting to move onto the next project in my home. For myself and this blog. I hope you guys enjoyed this, I have loved the tour through blogland posts I have seen from others. Thank you so much Canary street crafts for choosing me as one of your blogs to share this experience with. I also got to choose two blogs to have you all visit next week, Monday September 8. 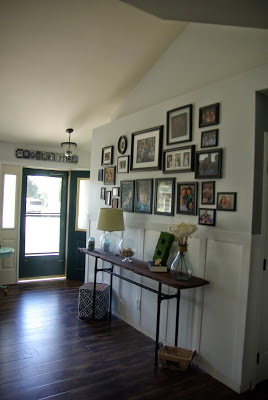 The Bajan Texan is a fun blog with home decor ideas, DIY projects, great articles on raising kids, organizing.. You name it and Keitha writes about it. 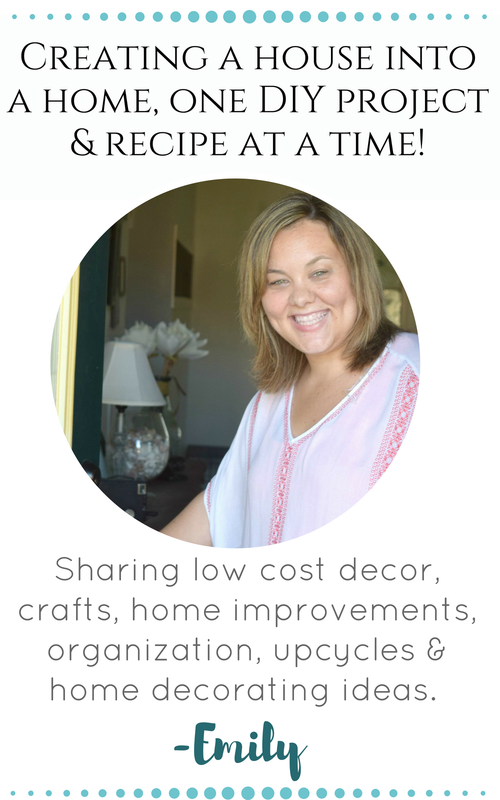 I will be hosting a Pinterest link party with her and 6 other bloggers starting next month. So look for that. Keitha will be hosting a tour through blogland next Monday, September 8. 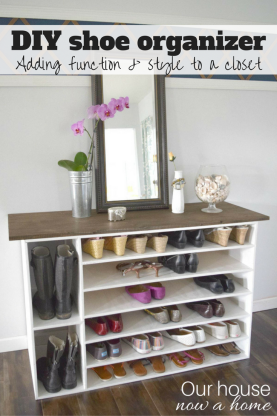 The DIY Mommy is one of the first blogs I stumbled upon. I kept clicking on images through my searches and ended back at the same place. Here, admiring Christina’s talent and home. She comes up with beautiful ideas for a home, and I am always inspired by her. She will also be hosting the tour through blogland with her own responses and then bloggers of her choosing next Monday September 8th. Thank you so much for stopping by! Be sure to follow me on Google+, Facebook, Twitter, email. This way you can stay up to date on the goings on at Our house now a home. Love everything you have done! Very impressed with all your projects! You and Dale make an amazing team! How I love to see what you are up to and this blog is AWESOME! Thank you for the kind words, I am really lucky that all of my ideas can become reality because of Dale! Thank you! Her room turned out great, her bed is so pretty. I want to have curtains over my bed now. I hope you had a great labor day weekend as well! Thanks so much for nominating me! I absolutely love your blog so it means alot to me that you thought of me! Posting mine tomorrow 🙂 Your home is stunning, your DIY are so awesome, glad i found you. You are so sweet! Thank you, I will be checking in tomorrow to see how your tour comes out.